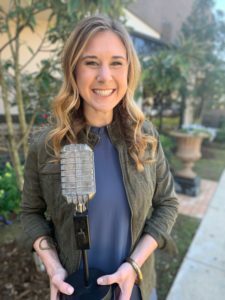 Louisiana Tech senior communication major Madison Kaufman usually broadcasts the news, but this time she is the news. Kaufman is the Student Broadcaster of the Year following the announcement of winners at the 2019 Prestige Awards Luncheon Thursday at the DoubleTree Hotel in Lafayette. “I don’t know if I entirely deserved it, but I know I couldn’t have done it without lots of help,” said Madison, who will graduate in May with both her degree and a minor in sports marketing. Her entry was judged on excellence, believability, creativity, and effectiveness. It included a written narrative and a 30-second video with sound for the award presentation. The contest was open to all high-school, undergraduate, and graduate students enrolled full-time in a Louisiana university, community college, or high school during the current school year. The athletic department was looking for camera workers when Madison was a sophomore. She volunteered and was put to work, first behind the camera and then in front of it, “more than willing to learn whatever they could teach me,” she said. Her duties today include the “What’s Up, Ruston?” videos, feature videos, sideline or courtside reporting for ESPN+ games, and pregame video rolls on Paul Millsap Vision, the high definition video display board presented by Origin Bank in the Thomas Assembly Center. Schillinger and wife Ammi, the proud mom, along with Dr. Amy Carwile, who encouraged Madison to enter the contest and is coordinator of Tech’s Department of Communication and Media Studies, drove down and back with Madison to the luncheon. The daughter of a football coach, Madison fell in love with sports early. Madison, 22, is a member of Kappa Delta sorority, a member of a pair of honor societies, and is deeply involved in ministry at Bridge Community Church in Ruston. Her current plan is to pursue a graduate degree in Industrial and Organizational Psychology at Tech; she’ll continue working in broadcasting and see where that leads.